(3) While your piece is drying, you can begin to gather the things you’ll need to finish it. Batting: Thick or thin depending on the look you want. You can layer it for thickness, too. You'll just need scraps for an ornament. Cardboard: I just use scrap cardboard, from the back of pads of paper. Backing fabric: Choose what you think will complement your piece. The gathering technique I will show works well for cottons, silks, and even velvets. I don’t use it with ultrasuede or felt, preferring to cut them without a seam allowance and sewing to the raw edge. Cording, fibers to make cording, and/or ribbon for a hanging loop: I nearly always use cording around the outer edge, it hides a multitude of sins. Sewing thread to coordinate with whatever color is most predominant on the edges of your needlepoint. One last thing you will need are three photocopies at 98% of your finished and blocked needlepoint. 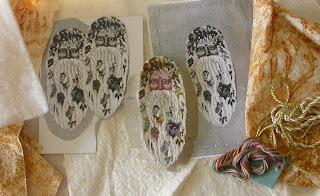 The photo above shows the trimmed needlepoint (next post), photocopies glued to cardboard (one cut out and on ready to be cut out), backing fabric (rust dyed), batting (the background of the photo and also the upper left, and some cording options (future post). (4) Glue two photocopies to two pieces of cardboard. If you can tell the grain of the cardboard (it rolls easily along the grain), then place one on grain and one across it. This helps protect against warping. The photocopies don’t have to be glued on tight. (Having the copy on the cardboard rather than tracing it makes it really clear which side is the right side.) Cut out the needlepoint shape following the photocopied pattern. (5) Glue a rough-cut piece of batting on top of each cardboard backed photocopy. Once it’s dry you can trim around the cardboard. I like to use two layers of batting on the front piece and one on the back piece. personal preference. Here is a piece of batting covered cardboard, trimmed. (6) Take the third photocopy and cut it out about an inch beyond the outer edge of the needlepoint design. This will be the pattern for your backing fabric. Pin this to the backing and cut out. This does not have to be exact. Maneuver the fabric and threads until the backing fabric is smooth all around and it’s taut on the cardboard (but not so the card bows) and take a couple of back stitches to secure the gathers. Then lace back and forth across the piece to hold it a bit more securely. Knot and cut the thread. 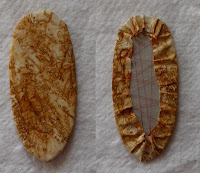 Final backing piece completed--the outside and inside shown.